Attention Arlington and Dallas residents! 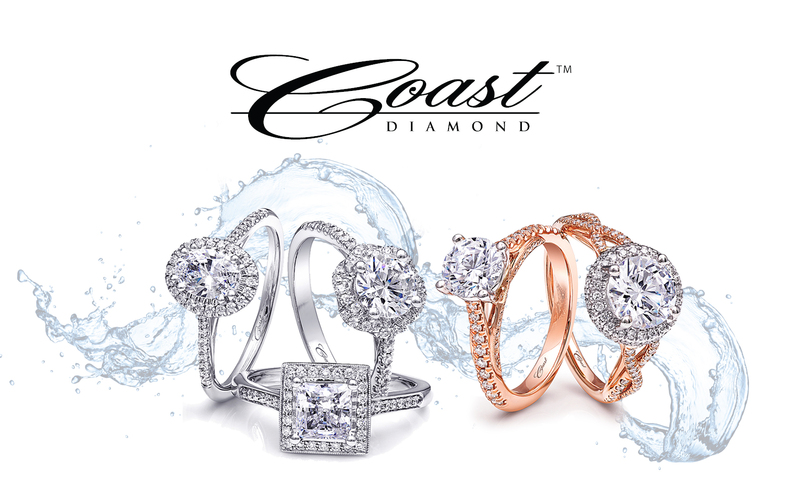 Robbins Brothers The Engagement Ring Store is hosting a Designer Event which will feature Coast Diamond! Stop by either store on Friday, November 3rd and Saturday, November 4th to take advantage of special in-store promotions featuring Coast Diamond engagement rings and diamond jewelry, including 24 Months Special Financing! The tradition continues for Goldstein’s Jewelers of Mobile, AL. Their excellent customer service and unrivaled selection allow us to celebrate them in their 138th year of success as the oldest fine jewelry store in Mobile. Stop into Goldstein’s and you will quickly understand how thoughtfully they consider your needs and how much they want your purchase with them to reflect the love you are celebrating and the occasion you are buying for. Whether you are shopping for an engagement ring (our favorite), an anniversary band, a birthday present, or just because… You will be ecstatic with your purchase at our Coast Diamond Retailer of the Week, Goldstein’s Jewelers of Mobile, AL. The shape of your engagement ring and/or center stone says a lot about you. Our Coast Diamond cushion shaped halo engagement ring (LC5257-100) set with a 1CT round center stone says you share classic romance. The round diamond is a classic choice in center stones, but the cushion shape of the engagement ring design is for the couple who is hopelessly in love. Read more about “How to Choose the Perfect Diamond Shape for You” on Goldstein’s Jewelers’ blog. This Coast Diamond petite halo wedding set (LC5390RG_WC5390RG) is pure warmth with its rose gold setting. To set apart the crown of the ring, it is set in white gold. For more options for customization of this petite halo engagement ring visit the Coast Diamond website and consult with a jeweler at Goldstein’s. Can’t wait to say “It came from Goldstein’s!” Visit them today! We are thrilled to celebrate another year with Goldstein’s Jewelers of Mobile, AL as our Coast Diamond Retailer of the Week! The solitaire engagement ring has been the most popular engagement ring design since forever. The options available to make a solitaire ring unique are endless. Every OC bride is unique and it is no surprise they dream of the endless ways to customize their engagement ring design. Kieu Hanh Jewelry of Westminster, CA is where OC brides are shopping for their solitaire engagement ring. Kieu Hanh Jewelry carries diamonds and fine jewelry at exceptional prices allowing you to create the engagement ring of your dreams. And when you are ready to upgrade your engagement ring, Kieu Hanh Jewelry’s upgrade policy makes it an exciting experience. OC brides love Kieu Hanh Jewelry and so do we. Kieu Hanh Jewelry of Westminster, CA is our Coast Diamond Retailer of the Week. Choosing a diamond center stone for a solitaire engagement ring can be truly enjoyable if you have the right jeweler. It is said (on yelp) that those at Kieu Hanh Jewelry are “helpful and patien(t) explaining the differences in diamond grade”. With competitive pricing on diamond center stones that Kieu Hanh offers you are able to choose a gorgeous diamond to complete your Coast Diamond engagement ring setting. The truly classic detail of the solitaire engagement ring design is the six prong center stone setting. The six prong setting holds a larger diamond firmly in its setting. Take your OC bride’s breathe away when you choose a round-brilliant or rose cut diamond center stone for this Coast Diamond setting. Coast Diamond six prong solitaire engagement ring (LC5244) with matching diamond band (WC5244). Click image for details. Coast Diamond designer Jay Gilbert is constantly in his design studio creating new and exciting ways to make Coast Diamond rings unique. Fine fish tail set diamonds (below) or a single hidden diamond in the gallery of a solitaire engagement ring is the perfect way to add extra sparkle to her finger. Congratulations to Kieu Hanh Jewelry of Westminster, CA for helping OC brides fulfill their solitaire engagement ring dreams and for being our Coast Diamond Retailer of the Week! Falling in love is a wonderful thing. The history of Sissy’s Log Cabin began in 1970 when Sissy Jones fell in love with an old log cabin off U.S. Highway 79 in Pine Bluff, Arkansas. She began Sissy’s Log Cabin with the sales and appraisal of antiques, but that love soon turned to fine jewelry. Sissy did what all of us do when we fall in love… she threw herself into learning everything she could about it. Sissy Jones credits her success to hard work, family, good friends, wonderful customers, and, of course, “the help of a few angels”. For almost fifty years Sissy’s Log Cabin has been a part of helping customers create lasting memories with the dedication of her wonderful staff that produce a quality of customer service that brings customers back time and again. Coast Diamond is delighted to have Sissy’s Log Cabin as an authorized dealer, as well as our Retailer of the Week. Stop in and visit Sharri, Bill and Sissy Jones at Sissy’s Log Cabin, family owned and operated since 1970. The Coast Diamond vintage, floral inspired 1CT halo engagement ring (LC6026). It is finished with iconic vintage details like fish tail set diamonds and milgrain edging. In true vintage spirit have this award winner set in platinum. The elegant, romantic and contemporary Coast Diamond woven engagement ring (LC6092) is paved with diamonds and finished with milgrain edging. You choose the perfect 1CT diamond center stone to complete it to perfection. The ultimate Coast Diamond wedding band (WZ5001H) with 0.75CT of round brilliant diamonds is the perfect start of luxurious layers of diamond and gemstone bands… or it is the ultimate finish for these Coast Diamond engagement rings. Congratulations to Sissy’s Log Cabin for being our Coast Diamond Retailer of the Week! Fall is romantic… The changing of the leaves – The warmth of a corner table at a cozy restaurant. Whether you are planning your proposal or celebrating an anniversary, fall is a very special time to celebrate love with the gift of a surprise diamond. If you are in Central Pennsylvania you want to find your diamond anniversary or engagement ring at Munn’s Diamond Gallery. Second generation owner Chris Munn lives for the moment a customer finds the surprise diamond they are looking for… “I can see the glimmer in their eye as soon as they spot it.” There is no better place to shop than with a jeweler who not only loves diamonds, but also loves people as Chris Munn does. We are thrilled to call Munn’s Diamond Gallery of Central PA our Coast Diamond Retailer of the Week. What are surprise diamonds? Discover their beauty here and visit Munn’s Diamond Gallery for more Coast Diamond ring designs and surprise diamond ideas. Hidden diamonds create extra sparkle. The timeless solitaire accented with surprise diamonds in the gallery (or side) of the diamond center stone is the perfect symbol of your love. A gorgeous diamond encrusted ring set with a unique center stone is a wonderful anniversary surprise. The all-time favorite Coast Diamond modern halo is perfect with a pear shaped center stone. Today is the day to visit Chris and the kind, caring and knowledgeable staff at Munn’s Diamond Gallery. Congratulations Munn’s Diamond Gallery of Central PA for being our Coast Diamond Retailer of the Week!